In this post, we’re going to add functionality to take a picture to our jQuery Mobile app using the PhoneGap Media Capture API. We’ll add a button with jQuery Mobile that brings up the mobile phone’s camera. 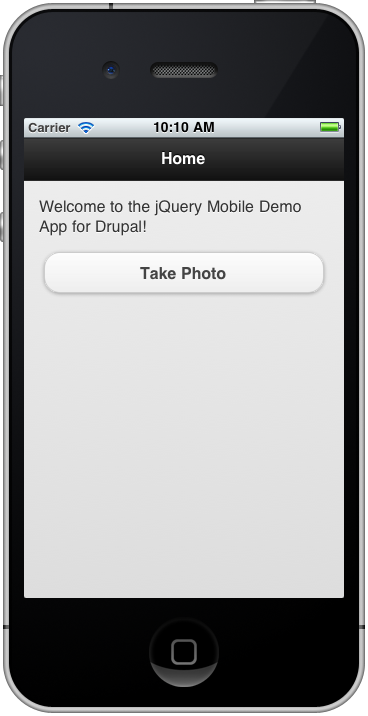 Welcome to the jQuery Mobile Demo App for Drupal! Run it in the iPhone Simulator, and it looks pretty good for us not having to do too much! We’ll take advantage of jQuery’s bind method and PhoneGap’s deviceready event for our button functionality. One gotcha you will probably run into is that you’re used to binding to the click event with jQuery on desktop browsers. With jQuery Mobile, we need to bind to the tap event for our button instead. You’ll need to provide functions to handle success and errors, along with PhoneGap’s CaptureImageOptions. In our case, we’re limiting the number of photos the user can take to one at a time. You won’t be able to see this run in the iPhone Simulator, because the iPhone Simulator doesn’t have a camera – instead, you’ll need to run it on an actual iPhone (or iPod Touch or iPad with a camera). In my next post, we’ll cover how to upload images to Drupal 7 using Services 3. 1. I am not sure if I saw part 3 , So I am eagerly looking forward to it. 2. We currently have Drupal 6 , so would it be possible to follow the same steps for 6 as well. Great tutorial. Quick question- Where would the script that you add to bind to tap event go in index.html? would it be in head after including phonegap and jquery mobile? It’s not to do anything about your explanation. I have also a phonegap and querymobile app and I want to add a notification alert on a link. Now I added this line: onclick=”showAlert(); but then it doesn’t work. When I delete a line of code like this one jquery.js. Then it works :S haha. Hmm, there might be a syntax error. Open up your www/index.html in your web browser and then open the web browser’s error console and see if there are some syntax errors. You can also use Weinre for debugging PhoneGap applications, but that’s pretty clunky.